I never really dress up for Halloween. I had a buddy that worked at Home Depot and would let me borrow his work apron. That was my costume. 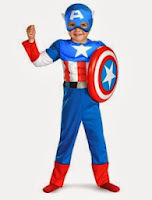 However, I'm going to rock it as Captain America this year with this new sale from Walmart. They have thousands of costumes right now for as low as $10. It doesn't matter who you are dressing up - a man, a woman, a child, a dog, a parakeet... there is something for everyone. My daughter will go as a princess, and me as a superhero, and we'll borrow a dog and make him the Hunger Games girl. Or maybe a bunch of us can go as Avengers. The fun is in the shopping, to be honest. Looking for decorations, trick-or-treat bags, accessories, makeup, or, you know, candy? There's a plethora of those items here too. Order online and if it doesn't fit you can return at your local store or ship back free of charge. Spend $50 and get FREE shipping. Click here to view the full list of costumes at Walmart.